California Eichler home with Japanese inspired landscaping. The 2 panels seem white but what about - the roof panels - what are they made of? and where from? thank you. Too expensive, I like the plastic it does look nice in person as well..
what is the name of the wicker chair with black iron legs? - love the wicker chair with black iron legs! what's the name of this chair shown on the deck next to the white ceramic pot? Is there deck joist on the underside of the composite deck, which leaves me to believe open air space, my question is more about drainage under the deck. Is there a French drain or catch basins to divert the water from collecting and causing algae growth or mosquito haven areas... Or even an increase of wood rot. There is no drainage system under the deck. It's not needed since the decks are both covered and the home is in San Jose which gets less than 10 inches of annual rainfall. It is raised to allow for circulation. 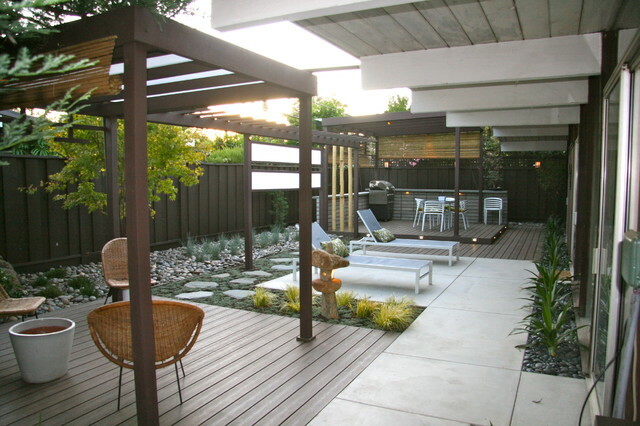 Modern Pergola - Is the pergola metal or wood? Custom? Geometric design and cover. Would not want this amount of cover. Just enough for the bonsai.